Blackjack Ballroom Casino prides itself on offering its players a reliable, trustworthy, and exciting online gaming experience. The online casino is regulated and licensed by the Kahnawake Gaming Commission. The casino holds eCOGRA’s Safe & Fair seal, and is run on Microgaming software. Blackjack Ballroom online casino uses independent auditors who review the random number generator software, with results published on its website. The online casino has a great welcome bonus in which players get to play with a free $850. There is an excellent VIP program, along with safe and secure banking, and accessible customer support. Blackjack Ballroom is part of the Casino Rewards group. Players may play in many different languages, and make deposits and withdrawals in more than one currency. Security: Blackjack Ballroom Casino uses the 128-bit SSL data encryption technology, and notes that security is taken seriously at its online casino site. $€500 deposit bonus on first 3 deposits! Blackjack Ballroom online casino offers a sign up bonus of $500. This free money can be used to play on real money games in the online casino. 1st deposit offering a 100% bonus up to $150 free! 2nd deposit offering a 50% bonus up to $200 free! 3rd deposit with a 25% bonus with up to $150 free! 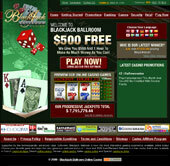 Blackjack Ballroom Casino is a member of the Casino Rewards loyalty program. Players enjoy benefits and incentives and special promotions. The loyalty points are accumulated from any of the partnered casinos. Points can be earned and spent at 29 participating online casinos. Although there is much focus on great online blackjack games at Blackjack Ballroom Casino, players are certainly not limited to only playing online blackjack games. The online casino offers more than 550 casino games including online slots, and progressive slots, video poker, parlor and table games, and of course, online blackjack. Blackjack Ballroom online casino is run on Microgaming’s software. Players can choose from a number of languages, including English, Dutch, German, Spanish, French, Italian, and many others. Players may choose from the UK £, the US $, the € and the CA $. Depending on which region the player is playing in, there are a number of choices of deposit and withdrawal methods. Blackjack Ballroom Casino has an online customer support center that is open 24 hours a day, 7 days a week. Players can contact the online casino via toll free telephone numbers, or by email. If players are unable to use the toll free numbers for any reason, they simply need to send their own telephone number to the customer support team by email and a representative will call the player.